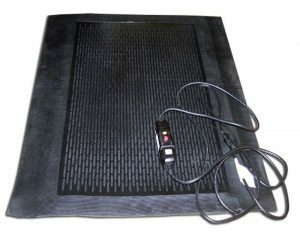 If you are looking to purchase a heated floor mat, read further. There are many types of floor mats available, from ice melting mats, to heated chair mats, to heated entrance mats. Whatever type of heated mat you are looking to purchase; this article certainly has you covered. This article will serve as a handy guide to the types that are available, as well as the situations in which you would want to use them. The good news is that all of the floor mats mentioned in this article can be purchased online and shipped to your home or business! Increasing comfort, and or safety, can make cold weather a little more enjoyable. 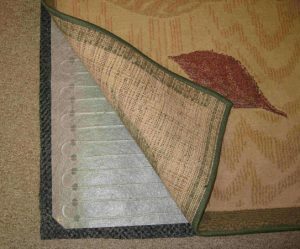 Heated mats are especially popular during the winter, and many homeowners buy them every year. Many people complain that their feet are always cold in winter time, even in doors. Luckily, foot warmer mats are the perfect remedy for cold feet (in the home…not at the alter!). Winter warmth mats, such as the super foot warmer mat are a great way for homeowners to walk around barefoot in winter without freezing their toes off. Hop online to discover some great heated floormats for your house. Once you purchase heated mats, you will wonder what took you so long! Ice melting mats are very good for outside entrances. 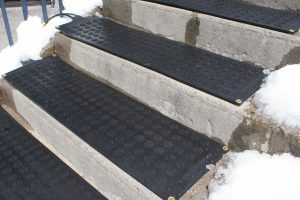 These mats are specially designed to keep people from slipping and falling, by melting away ice and snow accumulation. They are proven to greatly reduce slip and fall injuries. If safety is your top priority, consider purchasing ice melting mats today. These purposeful mats are completely water proof, offering traction to reduce slips and falls. These mats help combat the worst weather conditions, and easily be connected to each other. Keeping snow and ice build-up from your stair ways can be a much simpler process with the use of these winter stair treads. While helping to keep you and your family safe, they can also reduce shoveling and shoveling-related injuries. These mats are 3’ x 5’, and are reversible, allowing you to flip it on whichever side is closest to the power outlet. Four mats can be connected together, and the raised square design lets the water run off, helping keep the surface dry to help prevent slips and falls. This advanced snow melting mat can be used indoors or outdoors, with outdoor temperatures of 70 degrees and indoor of 100 degrees. In an office or lab setting, footwarmer mats and heated chair mats can really help keep the chill away. Footwarmer mats can melt snow from boots, or just keep feet warm at desks and standing work stations. The Floormat heated chair mat provides radiant heating under your chair or workstation, allowing you to focus on work while feeling warm and toasty. Keeping employees warm, especially on chilly days, can increase comfort and circulation, which in turn boosts efficiency and productivity.